Our guest’s favorite choice! Imagine powering out to the lobster grounds. Snorkel in crystal clear water, locating a Caribbean lobster hole. 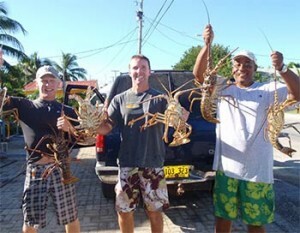 You are always sure to find lobsters with help from one of our experienced local guides. Returning to our special beach bar restaurant having it served to you with melted butter, garlic, cheese and all of the fixings. Close your eyes and taste it! What could be better? This amazing excursion is the only one of its kind in the Cayman Islands. Available during lobster season (December- February). The maximum number of people we take for this tour is 6 people. Free shuttle service available to guests staying at hotels in the Georgetown and 7 Mile Beach area or for Cruise Ship passengers free shuttle from the Hard Rock Café.